Where Does It Go after It's Collected? Oahu generates more than 2.2 million tons of waste annually from residential, commercial and industrial sources. At your home, about 15% of your trash is recyclable newspaper, aluminum, glass and plastic; and 25 - 30% is compostable yard trimmings. What is in your trash at work varies with the type of business. In an office, as much as 85% of what goes into trash cans is recyclable office paper. In a retail operation, a major component of the waste is cardboard. In a restaurant, you will find a lot of glass and food waste in the trash. A Waste Characterization study breaks down our waste into categories. Where does it go after it is collected? The City's H-POWER waste-to-energy plant in Campbell Industrial Park processes over 700,000 tons of waste annually, producing up to 10% of Oahu's electricity. All of the waste collected from our homes has been taken to H-POWER since it began operation in 1990. Most residential and general commercial trash is disposed of at H-POWER. Noncombustible construction and demolition (C&D) debris and industry wastes go directly to landfill. The Waimanalo Gulch Sanitary Landfill is one of two landfills on Oahu. The other landfill in Nanakuli is permitted for construction and demolition waste only. The City's goal is to minimize the use of landfill for waste disposal. Waste-to-energy (H-POWER) and recycling currently divert more than one million tons of waste from landfill annually. H-POWER began operation in 1990 and today converts approximately 2,000 tons of waste per day into enough electricity to power 60,000 homes. H-POWER is the cornerstone of Honolulu's integrated waste management system. 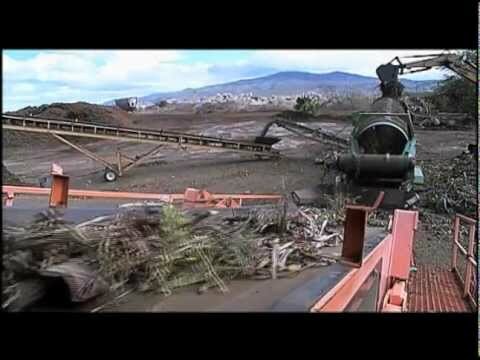 H-POWER produces up to 10% of Oahu’s electricity and reduces the volume of refuse going to landfill by 90%. On Oahu, waste-to-energy works in partnership with recycling efforts to significantly reduce the amount of waste going to landfills. H-POWER in Campbell Industrial Park processes over 700,000 tons of waste annually, and is capable of producing up to 10% of Oahu's electricity. All of the waste collected from our homes has been taken to H-POWER since it began operation in 1990. In May, 2015, H-POWER opened a first-of-its-kind sewage sludge receiving station that injects sewage sludge directly into the facility’s mass burn unit where it is diffused into the refuse for incineration. This new processing system at H-POWER enables the City to redirect more than 40,000 tons per year from the landfill; 20,000 tons of sewage sludge along with 20,000 tons of bulky waste which had to be combined with sludge to settle it properly in the landfill. The 40,000 tons of additional bulky wastes and sewage sludge will be converted into the energy equivalent of 22,000 barrels of oil, generating enough electricity to power 6,500 homes. H-POWER reduces the volume of waste by 90% through incineration with 10% (ash) going to landfill. In addition to reducing the volume of waste entering the plant by 90% through incineration, H-POWER is actively engaged in recycling. Virtually 100% of the ferrous and nonferrous metal is recovered for recycling. The facility's pre-processing system uses magnets to pull metals from the waste stream and eddy current separators extract non-ferrous metals from the ash, diverting approximately 20,000 tons of ferrous metals (tin cans) and 2,500 tons of non-ferrous metals (aluminum cans) to recycling annually. Moreover, H-POWER reduces our dependence on imported oil. One ton of trash produces saleable energy equivalent to 60 gallons of oil. A six-minute video about H-POWER and a virtual conceptual tour of the 2012 expansion project are available for viewing in the media library. HECO Currents Newsletter: "Power Junk: How Trash is Turning on Your Electric Lights (and more)"
Recycling and composting will reduce the amount of waste going to disposal sites. Existing landfills will last longer. And it makes so much sense to utilize our waste as a resource for remanufacturing new products. In 1988, the year before the City began organizing its recycling effort, Oahu recycled approximately 100,000 tons of material. Today, we recycle more than 400,000 tons of General Material and 800,000 tons of Construction and Demolition Material. See Oahu Recycling Rates 1988 - present. Curbside recycling has been expanded islandwide and most businesses have recycling programs in compliance with local mandates. Follow this link to learn more about the City's Future Plans. Curbside recycling bins make sorting easy – gray for refuse, green for green waste, and blue for mixed recyclables. The City encourages everyone to get on board with recycling, and understands the effectiveness of leading by example. Any mandatory recycling requirements that the City imposes on the commercial sector, it also imposes on itself. Current disposal restrictions on cardboard and green waste apply to commercial and government facilities. City government employees have recycled more than 250,000 pounds of paper annually since the beginning of the City's office paper recycling program in 1989. All yard trimmings and grass from City parks and grounds are mulched or composted. City streets have been paved with glasphalt, an asphalt mixture containing crushed glass. The glass came from Oahu residential and commercial collection programs. The City buys only recycled-content paper to support the recycled paper market. That means everything from toilet tissue and paper towels to copier and computer paper is purchased with recycled content. The City continues to explore other types of products made from recycled material - such as recycled plastic lumber - which could be used in place of products currently being purchased. The Honolulu Zoo has become a showcase for recycled products. The Zoo has been making good use of products manufactured from your recycled milk jugs, glass containers and yard trimmings collected around the island. While you visit with the animals, check out "We Recycle, too at the Zoo." This crushed glass garden sculpture created by Hawaiian Cracked Glass for the Honolulu Zoo can be found in the Elephant Encounter Area. In the Elephant Encounter Area and the new Tropical Stroll Garden you’ll find recycled plastic benches that were re-manufactured from milk jugs. Glass containers collected from community recycling programs have been crushed, mixed with asphalt to create glasphalt and used to pave the walkways. Those cute little elephant sculptures are made from crushed recycled glass, too. It takes 2,700 milk jugs to make a picnic table.